Want to test your mettle against the hottest burger ever put out by a mainstream fast food company? 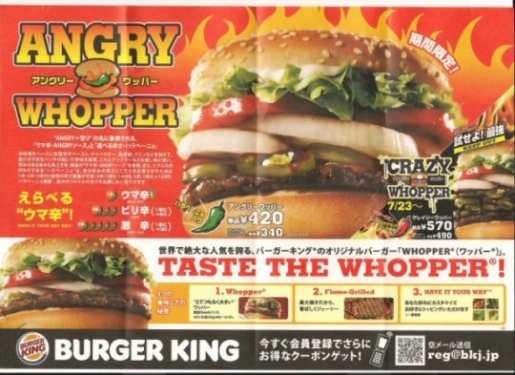 Then I suggest you get to Japan, because on July 23, 2010, the company plans on releasing the Crazy Whopper. What’s so crazy about it? Well, for one, it’s going to be 30 times hotter than the Angry Whopper, and the Angry Whopper is covered in jalapeno peppers! For weird Whopper fans, Japan is king. I love me some heat, but I don’t know if I could handle that much jalapeno on a burger. I’ll definitely give it a shot, though! Bring that beast to America, Burger King, and I’ll stuff it into my face-hole without so much as a whimper. Given how many hot peppers I layer onto my subs, I can handle it! You can even put the world’s hottest chili pepper on it; what doesn’t kill me makes me stronger! I refuse to be beaten by a fast food sandwich!